Today was a gift. I spent it in a hospital waiting room as a family member was cared for. (All is well, by the way.) The gift was not only the excellent care she received, but also the forcing of me to sit in one place for an extended period of time. I came prepared with a briefcase full of items to entertain me. I pulled out one of the books I am currently reading—The Life You’ve Always Wanted by John Ortberg—and could not put it away. The page in the above picture caught my attention. I had to think on it for a while. How often do I incorporate my favorite things into my life, without guilt, and thoroughly enjoying them and recognizing them as gifts from God? My answer shamed me—not that often. In fact, I often do the opposite. I “tough out” many of my days, getting done what needs to be done. I save my favorite things for special days, instead of using them often, thus making many days special. Needless to say that “toughing out” my day does not produce much gratitude to God or joy. The theme of this chapter is about the need for joy in our spiritual life. If I’m not feeling especially close to God or “spiritual” maybe it’s because I am not enjoying what God has given me—possessions and people. Immediately I put into practice what I am learning in the other book I am reading, Make a List. I made several lists of what brings me joy from the topics Ortberg listed. Sports/outdoor activities that stretch and challenge me and I enjoy. Books that refresh and inspire me. Clothes that make me feel happy and more like me. What I consider to be beautiful. Music and movies that speak to my soul. I will continue to add to these lists as thoughts come to me. Start your own lists this evening. What joys, little and large, will you take the time to enjoy and thank God for? This is one way we will grow closer to God and reflect His image to the world. 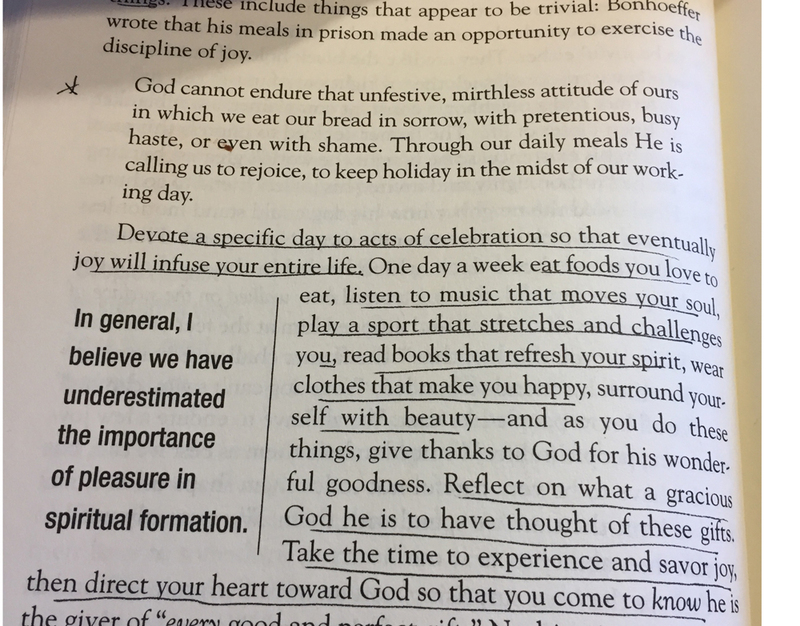 *John Ortberg, The Life You’ve Always Wanted (Zondervan Publishing: Grand Rapids), page 70. This entry was posted in faith, God is faithful, Intentional Living, Joy, Life-giving and tagged Confidence to live your calling, Faith, Intentional living, joy, spiritual growth. Bookmark the permalink.